Chronic hepatitis C virus (HCV) infection is characterized by diminished numbers and function of HCV-reactive T cells and impaired responses to immunization. Because host response to viral infection likely involves TLR signaling, we examined whether chronic HCV infection impairs APC response to TLR ligand and contributes to the origin of dysfunctional T cells. Freshly purified myeloid dendritic cells (MDC) and plasmacytoid DC (PDC) obtained from subjects with chronic HCV infection and healthy controls were exposed to TLR ligands (poly(I:C), R-848, or CpG), in the presence or absence of cytokine (TNF-α or IL-3), and examined for indices of maturation and for their ability to activate allogeneic naive CD4 T cells to proliferate and secrete IFN-γ. TLR ligand was observed to enhance both MDC and PDC activation of naive CD4 T cells. Although there was increased CD83 and CD86 expression on MDC from HCV-infected persons, the ability of MDC to activate naive CD4 T cells in the presence or absence of poly(I:C) or TNF-α did not differ between HCV-infected and healthy control subjects. In contrast, PDC from HCV-infected persons had reduced activation marker (HLA-DR) and cytokine (IFN-α) expression upon R-848 stimulation, and these were associated with impaired activation of naive CD4 T cells. These data indicate that an impaired PDC responsiveness to TLR ligation may play an important role in the fundamental and unexplained failure to induce new T cell responses to HCV Ags and to other new Ags as a consequence of HCV infection. Hepatitis C virus (HCV)3 is the most common cause of chronic viral hepatitis in the United States and results in significant morbidity and mortality (1, 2). HCV-induced abnormalities in antiviral immunity are hypothesized to contribute to the morbidity of this disease. We and others have observed a relative paucity of HCV-reactive cytokine-producing T cells in freshly prepared PBMC from subjects with chronic HCV infection, contrasting with normal frequencies of cytokine-producing T cells reactive with other Ags in the same subjects (3, 4, 5, 6, 7). Although the origin of selective dysfunction of HCV-reactive T cells is unknown, one possibility is that APC impairment associated with chronic HCV infection limits activation and maturation of anti-HCV-reactive T cells. If true, Ag-specific T cell responses primed before HCV infection may remain intact while responses primed to new Ags (both HCV and non-HCV) during chronic HCV infection would be diminished compared with uninfected controls. Consistent with this premise, HCV-infected individuals do have impaired response to neoantigen as provided by hepatitis A, hepatitis B, and influenza vaccination (8, 9, 10). Of the professional APCs, dendritic cells (DC) are a population of bone marrow-derived leukocytes with the distinct capability of directing the magnitude, polarity, and effector function of the naive T cell response (11, 12). DC have been characterized by cell surface phenotype and can be divided into two main subsets (myeloid DC (MDC) and plasmacytoid DC (PDC)) based on cell surface marker expression patterns (13). MDC are characterized by expression of CD11c, HLA DR, GM-CSF receptor, CD13 and CD33, and a lack of expression of IL-3 receptor (CD123) and lineage markers that define T cells, B cells, NK cells, and monocytes. PDC are characterized by the expression of CD123 and a lack of expression of CD11c and lineage markers. TLR are a family of receptors that recognize motifs shared by different classes of microbial pathogens and serve as a means for early recognition of microbial invasion. TLR are expressed on numerous cell types, including professional APC such as MDC and PDC, and their ligation by microbial elements is thought to be critical in DC activation and maturation. TLR-mediated activation of DC therefore provides an important pathway for the formation of an adaptive pathogen-specific T cell response (14, 15, 16, 17, 18). In chronic HCV infection, peripheral MDC and PDC numbers are decreased modestly (19, 20, 21, 22). The function of DC in HCV infection has been less clear, with some reports indicating an impaired ability of monocyte-derived MDC to mature or activate T cells, while other studies using similar methods have failed to find such defects (23, 24, 25, 26, 27). Discrepancies may be related to differences in in vitro expansion conditions used in the different studies. In addition, the ability of DC to secrete cytokines in response to TLR ligation has been described as both decreased and unaffected (19, 20, 22, 28, 29). In an effort to resolve these contradictory reports, we isolated enriched and well-characterized DC subsets from peripheral blood of HCV-infected persons and healthy controls and tested their ability, in the presence and absence of TLR ligand, to activate naive CD4 T cells in direct ex vivo assays. Our results demonstrate a selective defect in T cell activation by TLR ligand-stimulated PDC in chronic HCV infection. Participants were adult patients receiving care at the Cleveland Veterans Affairs Medical Center. Chronic HCV infection was defined by the presence of serum Abs to HCV for at least 6 mo and detectable HCV RNA in plasma. Individuals with a history of treatment for HCV infection were excluded. Healthy controls had no serum HCV Abs. All study subjects provided written informed consent for 100 ml of phlebotomy, and all studies were performed with approval of the institutional review board for human studies at the Cleveland Veterans Affairs Medical Center. Freshly prepared PBMC were fractionated into PDC (by positive selection using blood DC Ag (BDCA) 2 Abs) and MDC (by depletion of CD19+ cells followed by positive selection using BDCA1 Abs) (Miltenyi Biotec). Analysis was not performed when DC product purity was <50% (this occurred for one MDC sample and two PDC samples). Average purity of PDC and MDC populations after selection was 70 and 95%, respectively, and did not differ between study subject groups. Naive CD4 T cells (>97% CD4+RA+ cells) and unfractionated CD4 T cells (>95% CD3+CD4+ cells) were prepared by a negative selection method (EasySep and RosetteSep reagents, respectively; StemCell Technologies). Isolated PDC and MDC were cultured for 20 h at 37°C in complete RPMI 1640 medium (Invitrogen Life Technologies) with 1% penicillin-streptomycin, 1% l-glutamine, and 5% human AB serum (Gemini Bio-Products) in the presence or absence of TLR ligands. MDC are known to express TLR3, while PDC are known to express TLR7 and TLR9 (15). For TLR ligand stimulation assays, MDC were stimulated with the TLR3 ligand poly(I:C) (50 μg/ml; Amersham Biosciences) in the presence or absence of recombinant TNF-α (5 ng/ml; PeproTech), while PDC were stimulated with the TLR7/8 ligand R-848 (imidazoquinoline compound, resiquimod, 1 μg/ml; InvivoGen) in the presence or absence of the TLR9 ligand type A CpG 2216 (10 μM; Integrated DNA Technologies) and rIL-3 (10 ng/ml; R&D Systems). Culture supernatants were analyzed for cytokines (IFN-α and IL-6) by ELISA (IFN-α; BioSource International and IL-6, eBioscience). MDC were stained with anti-CD11c, anti-CD83, anti-HLA DR, and anti-CD86 while PDC were stained with anti-BDCA-4, anti-CD83, anti-HLA DR, and anti-CD86 for 20 min at 25°C, washed in PBS plus 0.01% BSA, fixed in 1% paraformaldehyde, then stored at 4°C until analysis. All Abs except anti-BDCA-4 were obtained from BD Biosciences, while anti-BDCA-4 was obtained from Miltenyi Biotec. Stained cells were analyzed by flow cytometry (FACSCalibur; BD Biosciences) using CellQuest software (BD Biosciences). Isolated MDC and PDC obtained from healthy controls and from HCV-infected patients were tested in increasing numbers (1,000, 3,000, and 10,000 cells/well) for their ability to activate allogeneic naive CD4 T cells (3 × 105/well) obtained from three unrelated healthy controls in IFN- γ ELISPOT assays. Cultures were performed in the presence and absence of TLR ligands as described above. Cells were placed into 96-well round-bottom plates for 48 h at 37°C then transferred to ELISPOT plates (Whatman) precoated with IFN-γ capture Ab (4 μg/ml clone 2G1; Endogen) and incubated for 20 h at 37°C. The plates were then developed and analyzed as described previously (30, 31). In control assays that included TLR ligand and DC in the absence of T cells, no IFN-γ production was observed. DC-dependent naive CD4 IFN-γ was calculated by subtracting IFN-γ spot-forming units (sfu) in the absence of DC from those observed in the presence of DC (in the presence or absence of TLR ligand). CD80/86 blockade assays were performed in the presence of anti-CD80/anti-CD86 mAbs (clones P1.H5.A1.A1 and BU63; Ancell) at 10 μg/ml. For analyses of induction of allogeneic naive CD4 T cell proliferation, cells were transferred back to 96-well round-bottom plates on day 3, after the ELISPOT assay culture was completed, for an additional 48 h (day 5). [3H]Thymidine (0.5 μCi/well; MP Biomedicals) was added at that time, and incorporation was measured on day 6 by liquid scintillation spectrometry. We used conventional measures of central tendency and dispersion to describe the data and compared continuous variables by Mann-Whitney’s U test or Kruskal-Wallis’ test as needed. We used Wilcoxon’s rank sum test to compare paired variables (i.e., responses in the presence vs absence of stimulus). We compared proportions by Fisher’s exact test. To assess associations between continuous variables, we used Spearman’s rank correlation coefficient, as well as partial correlations to control for the effect of intervening variables when needed. All tests of significance are two-sided, and a p value ≤0.05 was considered to be significant. We focused initial experiments on freshly isolated DC MDC and PDC subsets using samples from healthy control subjects. We first investigated TLR ligand (poly(I:C)) enhancement of MDC activation of allogeneic naive CD4 T cells (97% CD4+RA+ cells). As shown in Fig. 1⇓A, poly(I:C) enhanced dramatically the MDC-dependent activation of naive CD4 T cells. PDC also were capable of activating naive CD4 T cells in these assays in a TLR ligand-dependent fashion (Fig. 1⇓B). This response derived from the naive CD4 T cell fraction and required >20 h (Fig. 1⇓C). Additional studies identified R-848 as a single agent capable of enhancing PDC activity in this system, while the combination of R-848, class A CpG 2216, and IL-3 further enhanced PDC-dependent naive CD4 T cell activation (2- to 3-fold, data not shown). Poly(I:C) was identified as an single agent capable of enhancing MDC-dependent naive CD4 T cell activation, while TNF-α further enhanced this activity (1.5- to 2.5-fold, data not shown). TLR ligand stimulation enhances DC ability to activate naive CD4 T cells. A, Freshly prepared, unstimulated MDC were compared with 50 μg/ml poly(I:C)-stimulated MDC ability to activate healthy control allogeneic naive CD4 T cells to secrete IFN-γ over 72 h. B, Unstimulated PDC were compared with 1 μg/ml R-848-stimulated PDC ability to activate healthy control allogeneic naive CD4 T cells to secrete IFN-γ over 72 h. C, Freshly prepared healthy control PDC stimulated with R-848 (1 μg/ml) were used to activate healthy control allogeneic naive CD4 T cells vs unfractionated CD4 T cells to produce IFN-γ over 20 and 72 h of culture. We next purified MDC and PDC from the blood of 19 healthy controls and of 16 chronically HCV-infected subjects who had never been treated for HCV infection. Clinical characteristics of the HCV-infected subjects are shown in Table I⇓. We obtained 2.3–8.6 × 105 MDC/108 PBMC and 0.8–4.9 × 105 PDC/108 PBMC from healthy controls, and 1.8–6.6 × 105 MDC/108 PBMC and 0.5–4.0 × 105 PDC/108 PBMC from HCV-infected subjects. Although MDC and PDC yields tended to be lower in HCV-infected persons samples than in healthy controls’ samples, this did not reach statistical significance (p = 0.052 and p = 0.19), a finding that is consistent with earlier reports of diminished numbers of circulating MDC and PDC in HCV infection (19, 20, 21, 22). We next investigated TLR-dependent DC activation of allogeneic naive CD4 T cells obtained from one healthy control. Fig. 2⇓ shows the ability of MDC and PDC to activate allogeneic naive CD4 T cells to produce IFN-γ in the presence or absence of TLR ligand, or TLR ligand and cytokine. Results show variability within each group and indicate no significant differences between the groups in the ability of MDC to activate naive CD4 T cells under these conditions (p > 0.2 for comparisons between groups at each DC number). In contrast, PDC prepared from HCV-infected subjects appear to be impaired in their ability to activate allogeneic naive CD4 T cells (CD4 T cells tended to be less frequently activated to produce IFN-γ in response to R-848 and R-848 plus CpG plus IL-3-treated PDC from HCV-infected subjects at 3,000 and 10,000 PDC, respectively; p = 0.09 for each comparison). TLR ligand-dependent, DC fraction-mediated activation of allogeneic naive CD4 T cells from one healthy donor. Freshly prepared MDC and PDC from HCV-infected (n = 15) and healthy control (n = 13) subjects were used in titrated numbers (x-axis) to activate one healthy control subject’s allogeneic naive CD4 T cells to produce IFN-γ in a 72-h culture performed in the absence of TLR ligand (MEDIA), presence of TLR ligand (poly(I:C) for MDC or R-848 with or without CpG for PDC), or presence of TLR ligand and DC-activating cytokine (TNF-α for MDC or IL-3 for PDC). To increase the breadth of HLA and other alloantigenic mismatches in our assay system and to minimize the possibility of unanticipated bias in matching stimulators and responders that might confound interpretation of our results, we evaluated each DC preparation in separate experiments for the ability to activate allogeneic naive CD4 T cells prepared from three unrelated healthy controls. This allowed us to separately analyze three potential allogeneic responses for each DC preparation and to assess the maximum of three tested naive CD4 cell responders for each DC fraction. Naive CD4 T cell fractions were less frequently activated to produce IFN-γ in response to R-848 plus CpG plus IL-3-treated PDC from HCV-infected subjects (p = 0.003, p = 0.01, and p = 0.09 for each responder at 10,000 PDC) (Fig. 3⇓A). When evaluating the maximum T cell response (of three tested) for each DC stimulator, we observed a decreased ability of PDC from HCV-infected subjects to activate naive CD4 T cells under conditions designed to optimize PDC function (p < 0.001 for 10,000 PDC/well in the presence of R-848 plus CpG plus IL-3, Fig. 3⇓B), and under submaximal PDC activating stimulus (p = 0.04 for 3,000/well in the presence of R-848). Similar results were obtained when the median (of three possible) T cell responses were evaluated (p = 0.01 at 10,000 PDC/well under optimized PDC activating condition). In contrast, MDC from patients and controls were comparable in their ability to drive naive CD4 T cells to produce IFN-γ (Fig. 3⇓, C and D, p > 0.2 for all comparisons). Decreased TLR-dependent PDC activation of naive CD4 T cells to secrete IFN-γ in HCV infection. A, R-848 plus 2216 plus IL-3-stimulated PDC (10,000 cells/well) activation of allogeneic naive CD4 T cells from three unrelated healthy control subjects to secrete IFN-γ. DC-dependent IFN-γ sfu were calculated for each healthy control allogeneic CD4 T cell fraction (R1 = ▪, R2 = ▴, R3 = •) by subtracting IFN-γ sfu in the absence of DC from those observed in the presence of DC. Statistical analysis for data with each healthy control allogeneic naive CD4 cell fraction are shown. B, Same stimulation of PDC as in A, while data are represented here as maximum (of three healthy control naive CD4 T cell fractions) response to each TLR-activated PDC. C, Poly(I:C) plus TNF-α-stimulated MDC (10,000 cells/well) activation of allogeneic naive CD4 T cells from three unrelated healthy control subjects to secrete IFN-γ. IFN-γ sfu shown for each healthy control allogeneic CD4 T cell fraction (R1 = ▪, R2 = ▴, R3 = •). D, Same stimulation of MDC as in C, while data are represented here as maximum (of three healthy control naive CD4 T cell fractions) response to each TLR-activated MDC. When analyzing T cell proliferation, we observed a decreased ability of PDC from HCV-infected subjects to activate naive CD4 T cells (p = 0.01; Fig. 4⇓, A and B). There were no detected differences in responses to MDC (Fig. 4⇓, C and D, p > 0.3 for all comparisons). DC ability to activate naive CD4 T cell proliferation and IFN-γ are directly related for MDC (r = 0.5, 0.7, and 0.9, p = 0.03, <0.001, and <0.001 for each of the three CD4 T cell responders when MDC were activated with poly(I:C) and TNF-α), while for PDC the relation was not as strong (p < 0.05 for only one CD4 T cell responder at one DC activating condition, while all other comparisons were not significant). TLR-dependent PDC activation of naive CD4 T cell proliferation is defective in HCV infection. A, R-848 plus 2216 plus IL-3-stimulated PDC (3000 cells/well) activation of allogeneic naive CD4 T cells from three unrelated healthy control subjects to proliferate. DC-dependent cpm shown for each healthy control allogeneic CD4 T cell fraction (R1 = ▪, R2 = ▴, R3 = •), and statistical analysis of data with each control CD4 fraction are shown. B, Same stimulation of PDC as in A, while data are represented here as maximum (of three healthy control naive CD4 T cell fractions) response to each TLR-activated PDC. 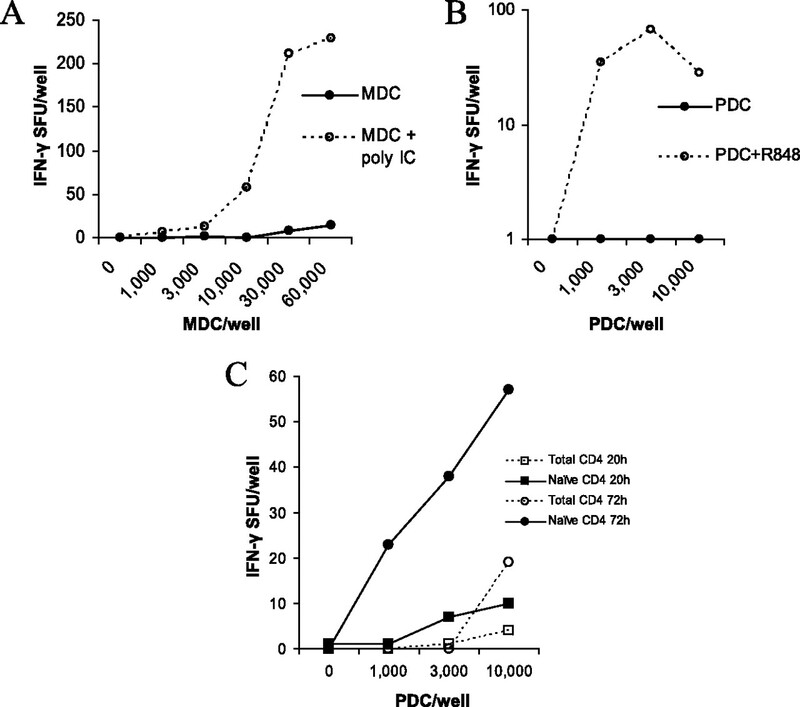 C, Poly(I:C) plus TNF-α-stimulated MDC (3000 cells/well) activation of allogeneic naive CD4 T cells from three unrelated healthy control subjects to proliferate. cpm shown for each healthy control allogeneic CD4 T cell fraction (R1 = ▪, R2 = ▴, R3 = •). D, Same stimulation of MDC as in C, while data are represented here as maximum (of three healthy control naive CD4 T cell fractions) response to each TLR-activated MDC. To provide insight into the basis of the defect in PDC function in HCV infection, we evaluated freshly isolated MDC and PDC for maturation marker (CD83, CD86, and HLA-DR) expression. As shown in Fig. 5⇓A, MDC from a representative healthy control subject expressed high levels of CD11C and HLA-DR, intermediate levels of CD86, and low levels of CD83. PDC from the same subject expressed high levels of BDCA2 and HLA-DR and low levels of CD83 and CD86. When maturation markers were compared between healthy control and chronic HCV-infected groups, we found higher CD83 and CD86 expression on MDC from HCV-infected subjects (p = 0.003 and p = 0.01; Fig. 5⇓B). In the PDC compartment, HLA-DR expression was lower in HCV-infected subjects (mean fluorescence intensity (MFI, median 805 vs 1,303, p = 0.04). Expression of MDC HLA-DR, PDC CD83, and PDC CD86 did not differ between groups (p = 0.6, p = 0.3, and p = 0.6, respectively). When we evaluated associations among clinical indices (aspartate aminotransferase, alanine aminotransferase (ALT), HCV level, bilirubin, albumin, platelet count), we found a trend toward a correlation between MDC CD83 expression and serum ALT levels (r = 0.49, p = 0.06) and between MDC CD83 expression and aspartate aminotransferase (r = 0.48, p = 0.06), indicating a relation between degree of liver inflammation and circulating MDC maturation state. Maturation state of freshly isolated DC subsets. A, Freshly prepared enriched MDC and PDC subset surface phenotype is shown for a representative healthy control subject. 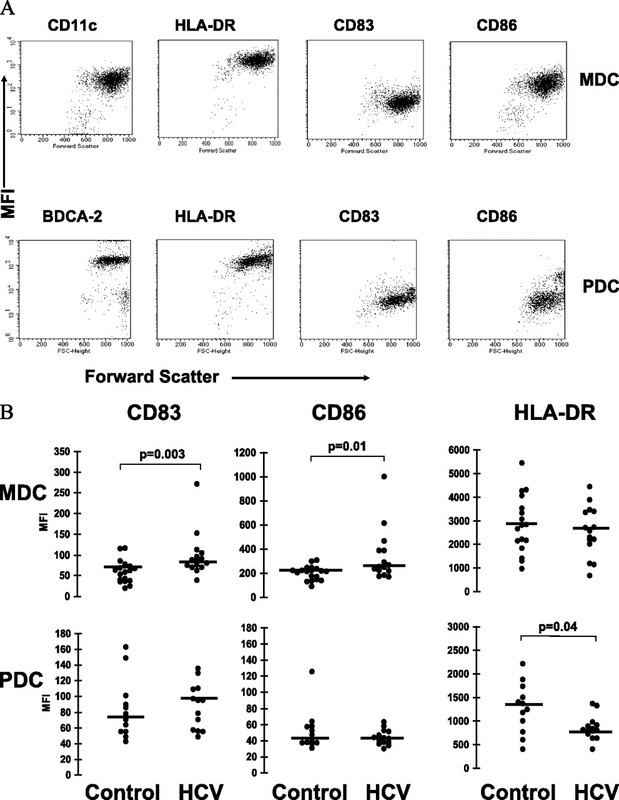 HLA-DR, CD83, CD86, and CD11C (for MDC), or BDCA-2 expression (MFI) is represented on the y-axis. B, Maturation state of freshly isolated MDC and PDC from HCV-infected and healthy control subjects. Because our functional studies indicated that PDC in HCV infection have diminished stimulatory capacity after TLR ligation, we next examined the effects of TLR ligation on the induction of cell surface markers on MDC and PDC. Fig. 6⇓ shows expression of CD83, CD86, and HLA DR on MDC and PDC after overnight culture with TLR ligands (poly(I:C) for MDC, or R-848 for PDC). HCV infection was not associated with impairment in induction of CD83 or CD86 on MDC after incubation with these TLR ligands. There was a nonsignificant trend toward lower levels of HLA-DR expression on MDC after TLR ligand stimulation (p = 0.1). In contrast, after TLR ligand stimulation, there were significantly lower levels of HLA-DR on PDC obtained from HCV-infected subjects than on PDC obtained from controls (MFI = 1,025 vs 1,787, p = 0.02). In HCV infection, PDC HLA-DR MFI is decreased after culture with TLR ligand (R-848). Freshly isolated MDC and PDC (30,000 cells/well) were cultured in the presence of TLR ligand (poly(I:C) for MDC and R-848 for PDC) for 20 h. Expression of CD83, CD86, and HLA-DR on TLR ligand-stimulated cells is represented for HCV-infected and healthy control subjects. We next examined the associations between TLR-dependent DC maturation and the ability to activate naive CD4 T cells. CD86 expression on poly(I:C)-stimulated MDC directly correlated with their ability to induce IFN-γ production by naive CD4 T cells in both healthy controls and HCV-infected subjects (r = 0.77, p = 0.001 and r = 0.64, p = 0.02, respectively). In support of CD86 playing a role in T cell activation, Ab blockade of CD80/CD86 inhibited TLR ligand-dependent MDC and PDC activation of naive CD4 T cells to produce IFN-γ by >95% (data not shown). There was also a direct correlation between levels of PDC HLA-DR expression after R-848 stimulation and the ability of these PDC to prime naive CD4 T cells in both healthy controls and HCV-infected subjects (r = 0.88, p = 0.001 and r = 0.97, p < 0.001, respectively). Conceivably the defect in the priming of naive CD4 T cells by TLR-stimulated PDC is related to their diminished expression of HLA-DR.
Cytokines that are secreted by DC are also known to influence the strength of the T cell response. We therefore tested for differences in production of cytokines by TLR-stimulated DC obtained from healthy controls and from HCV-infected patients. As shown in Fig. 7⇓, R-848 plus 2216 plus IL-3-stimulated PDC from HCV-infected patients produced significantly less IFN-α (p = 0.008) and IL-6 (p = 0.03) than did PDC from healthy controls. Although the number of samples analyzed for cytokine secretion was limited, there was a direct correlation between R-848-stimulated PDC IFN-α secretion and activation of naive CD4 T cells when PDC from both HCV and healthy control groups were analyzed together (r = 0.70, p = 0.04). TLR ligand-induced PDC IFN-α and IL-6 production is reduced in HCV infection. Freshly prepared PDC (30,000 cells/well) were cultured in the presence of TLR ligand or TLR ligand and activating cytokine (R-848 or R-848 plus 2216 plus IL-3) for 20 h. A, Culture supernatants were analyzed for IFN-α by ELISA. B, Culture supernatants were analyzed for IL-6 by ELISA. Impaired DC function during chronic HCV infection may contribute to the origin of the apparent selected defect in HCV-specific effector T cells and in the pathogenesis of HCV-related disease. To explore the range of DC responsiveness and function, we examined the ability of DC, in the unstimulated state and after incubation with selected TLR ligands, to activate naive T cell responses. After TLR ligand exposure, DC were >10-fold more active than unstimulated DC in their ability to activate naive CD4 T cells. We previously demonstrated diminished numbers of PDC and impaired TLR ligand-induced PDC IFN-α production in chronic HCV infection (19). In the present work, we found that in HCV infection, TLR ligand-stimulated PDC were impaired in their ability to activate naive CD4 T cells, while TLR ligand-stimulated MDC were not impaired. This defect was associated with reduced HLA-DR expression and diminished secretion of IFN-α and IL-6 following stimulation with TLR ligand, providing potential explanations to account for the differences in T cell activation. PDC are known to secrete large amounts of IFN-α in response to TLR7 and 9 activation (15), and when activated are capable of activating naive T cells (32, 33). Moreover, PDC are known to traffic to lymph nodes, where they can participate in T cell activation (34). The role of PDC in T cell activation during response to pathogens is yet to be determined in humans. We have confirmed here, using purified cell populations, that the TLR7-dependent activation of PDC to produce IFN-α is impaired in chronic HCV infection. In addition, we have demonstrated a diminished expression of HLA-DR on TLR7-activated PDC in HCV infection. Because both IFN-α and HLA-DR expressions were found to be associated with naive CD4 T cell activation, these factors may well underlie the impairment in naive CD4 T cell activation that we have shown here in PDC of HCV-infected persons. Importantly, because the TLR ligand was present throughout the period of ex vivo culture, we cannot exclude the possibility that TLR ligands interact directly with T cells in this system (in a DC-dependent fashion). However, the association between the effects of TLR ligation on PDC activation and subsequent T cell activation suggests that these activities are linked, and that the defect is primarily in TLR ligand-dependent activation of DC, which in turn have an impairment in the ability to activate naive CD4 cells. Previous studies investigating TLR ligand-dependent PDC IFN-α have been mixed with regard to whether there is a defect on a per cell basis during chronic HCV infection (19, 20, 21, 22, 29, 35, 36, 37). Differing results may be attributable to method of analysis, ranging from different TLR ligand stimuli (R-848 vs CpG, and differing CpG), analysis of enriched PDC vs unfractionated PBMC, and different methods of IFN-α detection (flow cytometric analysis of intracellular cytokine expression using one mAb vs ELISA analysis of multiple-secreted IFN-α subtypes). Notably, our results are in agreement with those obtained using the system most similar to that used here (purified DC fractions and ELISA-based detection of IFN-α subtypes) (29, 37). Overall, data here support a potential link between PDC IFN-α secretion and ability to activate T cells. The mechanism underlying the observed defect in peripheral PDC response to TLR ligand in HCV infection is unclear. The presence of HCV RNA within APC has been proposed as a possible cause of impaired allostimulatory function (24). Although we have not examined PDC for the presence of HCV in the current study, there is experimental support for this model since DC from normal donors transduced with adenovirus-expressing HCV genes, or treated with recombinant HCV proteins, have an impaired ability to stimulate CD4 T cells to proliferate (38, 39, 40). Other potential causes of impaired PDC function include the presence of inhibitory soluble factors during chronic HCV infection that contribute to reduced formation, increased destruction, altered trafficking/compartmentalization, altered TLR signaling, or TLR desensitization of DC. Evidence for the latter possibility has been found in other systems, with operative mechanisms involving heterologous TLR desensitization and specific pathogen-encoded products that inhibit Toll-mediated signaling (41, 42, 43). Data in support of enhanced PDC destruction indicate that TLR ligand-induced PDC apoptosis is enhanced in HCV infection (37). Evidence supporting DC compartmentalization in the case of HCV infection includes data suggesting greater frequencies of DC subsets in the liver than in the periphery (21, 22). Whether the maturation state of DC in one compartment differs from that in the other is not known. In this study, we observe an alteration of the peripheral DC activation/maturation state (CD83 and CD86 expression on MDC and HLA-DR expression on PDC) at baseline that tends to be associated with indices of liver inflammation (in the case of MDC CD83 expression). DC CD83 expression has been proposed to have an effect on DC activation of T cells (44), although this relation was not observed here in the case of MDC. Although PDC CD83 expression did not differ in the HCV-infected group as a whole, it is interesting to note that there is significant variability within the group, indicating that future analysis of larger cohorts of subjects may reveal subsets with altered CD83 expression. This suggests that chronic HCV infection itself or the activity of the disease due to HCV infection alters the phenotype and potential function of peripheral DC before cell isolation. A number of studies using allostimulatory MLR conducted over periods of 5 days of in vitro culture, after prior in vitro cell expansion, have demonstrated impaired function of APC from HCV-infected persons (23, 24, 25), while no defect has been found in others (26, 36). Minor differences in in vitro culture and cell expansion technique may explain the different findings of these studies. Two studies specifically investigating MDC and PDC function in chronic HCV infection have included DC activation conditions other than through the use of TLR ligands: one indicating a defect in a chronic HCV-infected subject’s MDC and PDC ability to activate T cells, while the other indicating no defect in the MDC’s ability to activate T cells (29, 36). In this study, when we focused on freshly prepared, unexpanded DC subsets in direct ex vivo assays, we found a marked defect in TLR ligand-induced PDC function. Importantly, these studies, including the present one, analyze enriched DC populations that are 70–95% pure. Therefore, a cell type other than DC may contribute to the observed activity. Although this remains a possibility here, the fact that we observe a strong relationship between PDC’s maturation/activation and ability to activate naive T cells suggests that the dominant portion of the defect we observe is in the PDC compartment. Viruses have evolved to use multiple means for subversion of the immune system, including interference with cell surface expression of the MHC-Ag complex by many different mechanisms, and altered cell surface expression of coreceptors (45). In general, microbes can evade host surveillance by interfering with DC generation, survival, maturation, Ag processing/presentation, and ability to activate or prime T cells (46). Infection with a number of viruses other than HCV, including Ebola, HIV, Lassa, HSV, and dengue and measles viruses, has also been shown to alter DC number or function (47, 48, 49, 50, 51, 52, 53). Our data in this study indicate during chronic HCV infection that there is a defect in the PDC’s ability to respond to the TLR7 ligand, resulting in an inability to activate naive CD4 T cells. Although the role of PDC in T cell activation is not well described, the results presented here suggest that defects in PDC function may contribute to an ineffective host response to neoantigen and/or TLR ligand-expressing pathogens. Consistent with this notion is the observation of impaired HCV-infected host responsiveness to neoantigen in the form of vaccine (8, 9, 10). Future studies investigating the role of DC function as it relates to HCV-infected host responsiveness to neoantigen and/or TLR ligand-expressing pathogen are indicated to further define the role of DC function in HCV infection. We thank the study subjects for their participation. ↵1 This work was supported by Veterans Affairs Advanced Research Career Development, Veterans Affairs Merit, National Institutes of Health (NIH 1R21AI67094 and NIH R01 DK068361), and the Case Western Reserve University Center for AIDS Research Core facilities (AI 36219). ↵3 Abbreviations used in this paper: HCV, hepatitis C virus; DC, dendritic cell; MDC, myeloid DC; ALT, alanine aminotransferase; PDC, plasmacytoid DC; sfu, spot-forming unit; MFI, mean fluorescence intensity; BDCA, blood DC Ag. Freeman, A. J., G. J. Dore, M. G. Law, M. Thorpe, J. Von Overbeck, A. R. Lloyd, G. Marinos, J. M. Kaldor. 2001. Estimating progression to cirrhosis in chronic hepatitis C virus infection. Hepatology 34: 809-816. Lauer, G. M., B. D. Walker. 2001. Hepatitis C virus infection. N. Engl. J. Med. 345: 41-52. Valdez, H., D. Anthony, F. Farukhi, A. Patki, J. Salkowitz, P. Heeger, D. L. Peterson, A. B. Post, R. Asaad, M. M. Lederman. 2000. 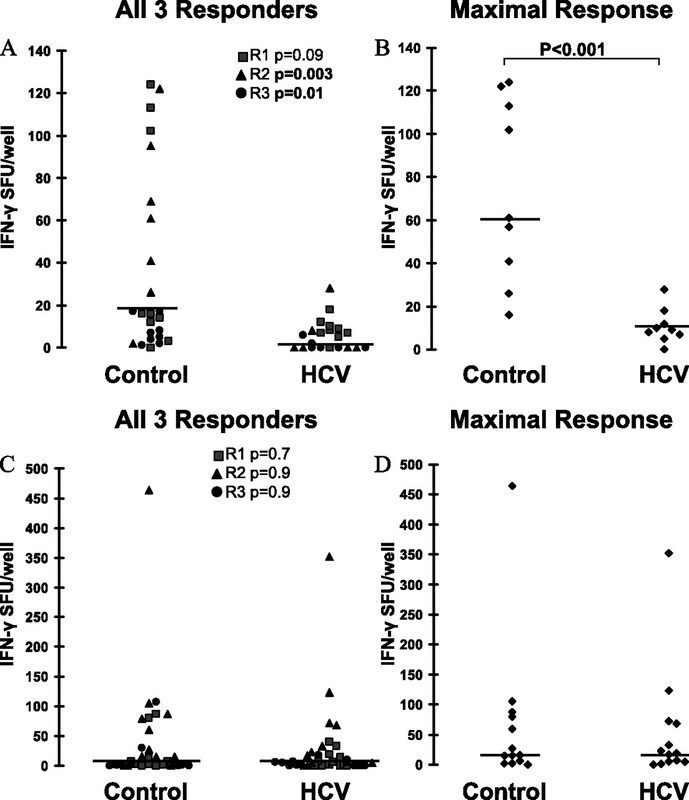 Immune responses to hepatitis C and non-hepatitis C antigens in hepatitis C virus infected and HIV-1 coinfected patients. AIDS 14: 2239-2246. Valdez, H., N. L. Carlson, A. B. Post, R. Asaad, P. S. Heeger, M. M. Lederman, P. V. Lehmann, D. D. Anthony. 2002. HIV long-term non-progressors maintain brisk CD8 T cell responses to other viral antigens. AIDS 16: 1113-1111. Gruener, N. H., F. Lechner, M. C. Jung, H. Diepolder, T. Gerlach, G. Lauer, B. Walker, J. Sullivan, R. Phillips, G. R. Pape, P. Klenerman. 2001. Sustained dysfunction of antiviral CD8+ T lymphocytes after infection with hepatitis C virus. J. Virol. 75: 5550-5558. Wedemeyer, H., X. S. He, M. Nascimbeni, A. R. Davis, H. B. Greenberg, J. H. Hoofnagle, T. J. Liang, H. Alter, B. Rehermann. 2002. Impaired effector function of hepatitis C virus-specific CD8+ T cells in chronic hepatitis C virus infection. J. Immunol. 169: 3447-3458. Keeffe, E. B., S. Iwarson, B. J. McMahon, K. L. Lindsay, R. S. Koff, M. Manns, R. Baumgarten, M. Wiese, M. Fourneau, A. Safary, et al 1998. Safety and immunogenicity of hepatitis A vaccine in patients with chronic liver disease. Hepatology 27: 881-886. Wiedmann, M., U. G. Liebert, U. Oesen, H. Porst, M. Wiese, S. Schroeder, U. Halm, J. Mossner, F. Berr. 2000. 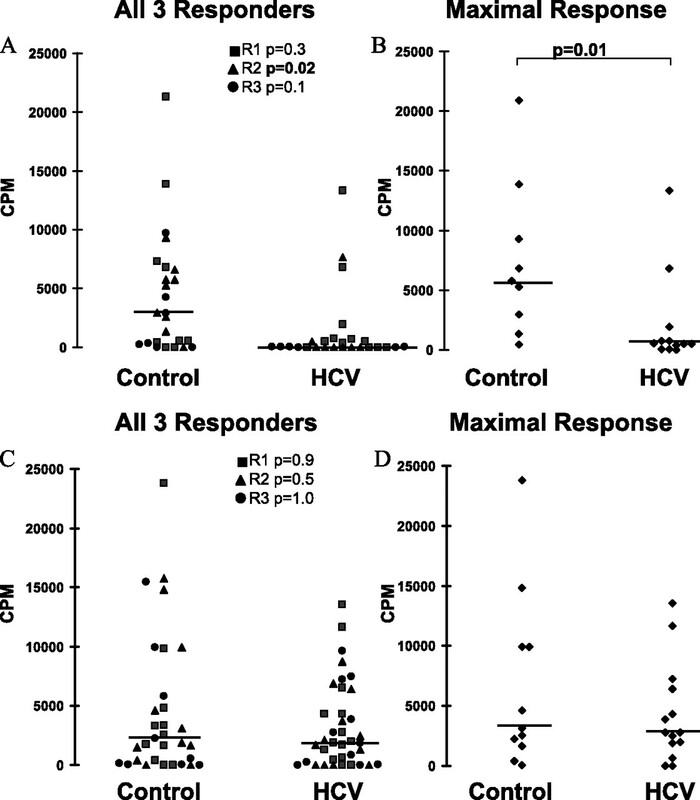 Decreased immunogenicity of recombinant hepatitis B vaccine in chronic hepatitis C. Hepatology 31: 230-234. Lanzavecchia, A., F. Sallusto. 2001. The instructive role of dendritic cells on T cell responses: lineages, plasticity and kinetics. Curr. Opin. Immunol. 13: 291-298. Adams, S., D. W. O’Neill, N. Bhardwaj. 2005. Recent advances in dendritic cell biology. J. Clin. Immunol. 25: 87-98. McKenna, K., A. S. Beignon, N. Bhardwaj. 2005. Plasmacytoid dendritic cells: linking innate and adaptive immunity. J. Virol. 79: 17-27. Lore, K., M. R. Betts, J. M. Brenchley, J. Kuruppu, S. Khojasteh, S. Perfetto, M. Roederer, R. A. Seder, R. A. Koup. 2003. Toll-like receptor ligands modulate dendritic cells to augment cytomegalovirus- and HIV-1-specific T cell responses. J. Immunol. 171: 4320-4328. Anthony, D. D., N. L. Yonkers, A. B. Post, R. Asaad, F. P. Heinzel, M. M. Lederman, P. V. Lehmann, H. Valdez. 2004. Selective impairments in dendritic cell associated function distinguish HCV and HIV infection. J. Immunol. 172: 4907-4916. Szabo, G., A. Dolganiuc. 2005. Subversion of plasmacytoid and myeloid dendritic cell functions in chronic HCV infection. Immunobiology 210: 237-247. Ulsenheimer, A., J. T. Gerlach, M. C. Jung, N. Gruener, M. Wachtler, M. Backmund, T. Santantonio, W. Schraut, M. H. Heeg, C. A. Schirren, et al 2005. Plasmacytoid dendritic cells in acute and chronic hepatitis C virus infection. Hepatology 41: 643-651. Wertheimer, A. M., A. Bakke, H. R. Rosen. 2004. Direct enumeration and functional assessment of circulating dendritic cells in patients with liver disease. Hepatology 40: 335-345. Auffermann-Gretzinger, S., E. B. Keeffe, S. Levy. 2001. Impaired dendritic cell maturation in patients with chronic, but not resolved, hepatitis C virus infection. Blood 97: 3171-3176. Bain, C., A. Fatmi, F. Zoulim, J. P. Zarski, C. Trepo, G. Inchauspe. 2001. Impaired allostimulatory function of dendritic cells in chronic hepatitis C infection. Gastroenterology 120: 512-524. Kanto, T., N. Hayashi, T. Takehara, T. Tatsumi, N. Kuzushita, A. Ito, Y. Sasaki, A. Kasahara, M. Hori. 1999. 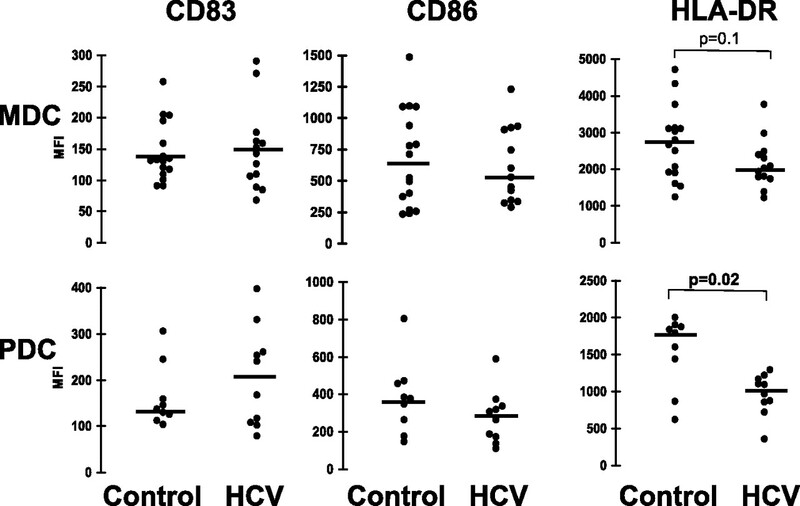 Impaired allostimulatory capacity of peripheral blood dendritic cells recovered from hepatitis C virus-infected individuals. J. Immunol. 162: 5584-5591. Longman, R. S., A. H. Talal, I. M. Jacobson, M. L. Albert, C. M. Rice. 2004. Presence of functional dendritic cells in patients chronically infected with hepatitis C virus. Blood 103: 1026-1029. Rollier, C., J. A. Drexhage, B. E. Verstrepen, E. J. Verschoor, R. E. Bontrop, G. Koopman, J. L. Heeney. 2003. Chronic hepatitis C virus infection established and maintained in chimpanzees independent of dendritic cell impairment. Hepatology 38: 851-858. Goutagny, N., C. Vieux, E. Decullier, B. Ligeoix, A. Epstein, C. Trepo, P. Couzigou, G. Inchauspe, C. Bain. 2004. Quantification and functional analysis of plasmacytoid dendritic cells in patients with chronic hepatitis C virus infection. J. Infect. Dis. 189: 1646-1655. Kanto, T., M. Inoue, H. Miyatake, A. Sato, M. Sakakibara, T. Yakushijin, C. Oki, I. Itose, N. Hiramatsu, T. Takehara, et al 2004. 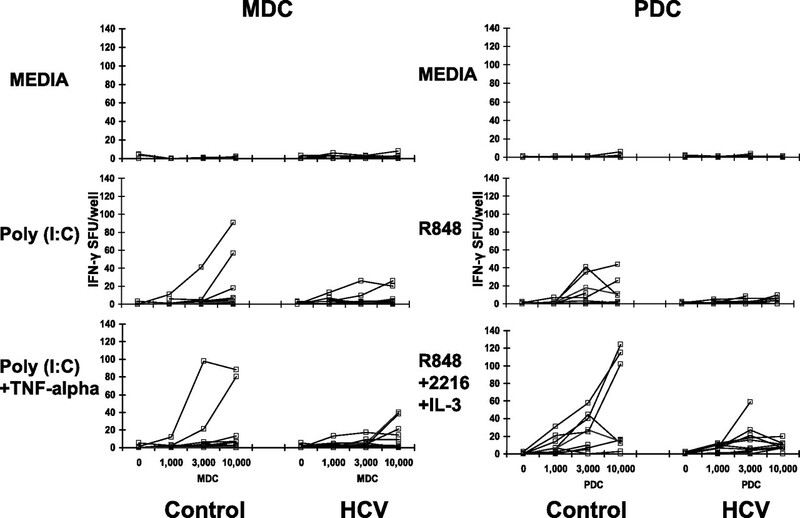 Reduced numbers and impaired ability of myeloid and plasmacytoid dendritic cells to polarize T helper cells in chronic hepatitis C virus infection. J. Infect. Dis. 190: 1919-1926. Anthony, D. D., A. B. Post, H. Valdez, D. L. Peterson, M. Murphy, P. S. Heeger. 2001. ELISPOT analysis of hepatitis C virus protein-specific IFN-γ-producing peripheral blood lymphocytes in infected humans with and without cirrhosis. Clin. Immunol. 99: 232-240. Karulin, A., M. Hesse, M. Tary-Lehmann, P. Lehmann. 2000. Single-cytokine-producing CD4 memory cells predominate in type 1 and type 2 immunity. J. Immunol. 164: 1862-1872. O’Doherty, U., M. Peng, S. Gezelter, W. J. Swiggard, M. Betjes, N. Bhardwaj, R. M. Steinman. 1994. Human blood contains two subsets of dendritic cells, one immunologically mature and the other immature. Immunology 82: 487-493. Yoneyama, H., K. Matsuno, E. Toda, T. Nishiwaki, N. Matsuo, A. Nakano, S. Narumi, B. Lu, C. Gerard, S. Ishikawa, K. Matsushima. 2005. Plasmacytoid DCs help lymph node DCs to induce anti-HSV CTLs. J. Exp. Med. 202: 425-435. Piccioli, D., S. Tavarini, S. Nuti, P. Colombatto, M. Brunetto, F. Bonino, P. Ciccorossi, F. Zorat, G. Pozzato, C. Comar, et al 2005. Comparable functions of plasmacytoid and monocyte-derived dendritic cells in chronic hepatitis C patients and healthy donors. J. Hepatol. 42: 61-67. Longman, R. S., A. H. Talal, I. M. Jacobson, C. M. Rice, M. L. Albert. 2005. Normal functional capacity in circulating myeloid and plasmacytoid dendritic cells in patients with chronic hepatitis C. J. Infect. Dis. 192: 497-503. Dolganiuc, A., S. Chang, K. Kodys, P. Mandrekar, G. Bakis, M. Cormier, G. Szabo. 2006. Hepatitis C virus (HCV) core protein-induced, monocyte-mediated mechanisms of reduced IFN-α and plasmacytoid dendritic cell loss in chronic HCV infection. J. Immunol. 177: 6758-6768. Sarobe, P., J. J. Lasarte, N. Casares, A. Lopez-Diaz de Cerio, E. Baixeras, P. Labarga, N. Garcia, F. Borras-Cuesta, J. Prieto. 2002. Abnormal priming of CD4+ T cells by dendritic cells expressing hepatitis C virus core and E1 proteins. J. Virol. 76: 5062-5070. Dolganiuc, A., K. Kodys, A. Kopasz, C. Marshall, T. Do, L. Romics, Jr, P. Mandrekar, M. Zapp, G. Szabo. 2003. Hepatitis C virus core and nonstructural protein 3 proteins induce pro- and anti-inflammatory cytokines and inhibit dendritic cell differentiation. J. Immunol. 170: 5615-5624. Dolganiuc, A., S. Oak, K. Kodys, D. T. Golenbock, R. W. Finberg, E. Kurt-Jones, G. Szabo. 2004. Hepatitis C core and nonstructural 3 proteins trigger Toll-like receptor 2-mediated pathways and inflammatory activation. Gastroenterology 127: 1513-1524. Lechmann, M., S. Berchtold, J. Hauber, A. Steinkasserer. 2002. CD83 on dendritic cells: more than just a marker for maturation. Trends Immunol. 23: 273-275. Palucka, K., J. Banchereau. 2002. How dendritic cells and microbes interact to elicit or subvert protective immune responses. Curr. Opin. Immunol. 14: 420-431. Feldman, S., D. Stein, S. Amrute, T. Denny, Z. Garcia, P. Kloser, Y. Sun, N. Megjugorac, P. Fitzgerald-Bocarsly. 2001. Decreased interferon-α production in HIV-infected patients correlates with numerical and functional deficiencies in circulating type 2 dendritic cell precursors. Clin. Immunol. 101: 201-210. Chehimi, J., D. E. Campbell, L. Azzoni, D. Bacheller, E. Papasavvas, G. Jerandi, K. Mounzer, J. Kostman, G. Trinchieri, L. J. Montaner. 2002. Persistent decreases in blood plasmacytoid dendritic cell number and function despite effective highly active antiretroviral therapy and increased blood myeloid dendritic cells in HIV-infected individuals. J. Immunol. 168: 4796-4801. Soumelis, V., I. Scott, F. Gheyas, D. Bouhour, G. Cozon, L. Cotte, L. Huang, J. A. Levy, Y. J. Liu. 2001. Depletion of circulating natural type 1 interferon-producing cells in HIV-infected AIDS patients. Blood 98: 906-912. Pichyangkul, S., T. P. Endy, S. Kalayanarooj, A. Nisalak, K. Yongvanitchit, S. Green, A. L. Rothman, F. A. Ennis, D. H. Libraty. 2003. A blunted blood plasmacytoid dendritic cell response to an acute systemic viral infection is associated with increased disease severity. J. Immunol. 171: 5571-5578.